"The young Greek pianist Katerina Stamatelos has recently given her first recital in Montreal. A graduate from the Conservatory of Music in Vienna, she proved to be a well-trained performer, in possession of skills required for the concert career. Elaborated touch allows her to extract mellow sounds out of the piano. And her technical achievements are impressive-just to remember smoothness of the broken chords in the last movement, Allegretto, of the Sonata KV 330 by Mozart. "Katerina Stamatelos is a romantic pianist. So she has been, at least for that evening, at her top while having been playing six pieces from "Poetical Impressions" op. 85 by A. Dvorak. Warm, inspired music by the great Czech composer suits Stamatelos perfectly, and she has given to us a very convincing performance-elegant as well as dynamic. Many good words could be said about the interpretation of the charming Sonatina by M. Ravel. The young pianist feels the style of this music. She uncovered hidden lyricism, so peculiar to Ravel and so often neglected by performers." "Having had the opportunity to attend a piano recital given by Ms. Stamatelos, I feel very happy to testify of her value. To me, she is a concert virtuoso." "Out of all the interpretations, it is only Katerina Stamatelos who is worth mentioning. She has unfolded the fascinating polyphony of the Sonata by R. Seitz with sovereignty." Soloist with the State Orchestra of Thessaloniki: the Khatchaturian Piano Concerto. Thessaloniki, 1978. The following samples are from a live performance of one of my doctoral piano recitals at the University of Iowa in 1998. "Ms. Katerina Stamatelos has been my student for nine years at the Conservatory of Thessaloniki. She has continued her studies at the Conservatory of Vienna and, at the same time, started a soloist career with great success. She is a charismatic person, with a remarkable technique and a rare musical sensibility. Cultured, responsible, hard on herself and her work, a true artist who insists on perfection." "Ms. Katerina Stamatelos has been a piano teacher at the Music Institutes of the City of Vienna, Music School Margareten, during the years 1978/1979 and 1979/1980. She engaged herself for her students with great knowledge and responsibility, so that she could earn remarkable success in the two years of her activity. Herself and outstanding pianist, she found ways to transfer her knowledge in a pedagogical way and has been as a human being very dependable and of a colleague. We regret her resignation very much." "Katerina Stamatelos has been my student at Kent State University since January 1985 when she came to this country from Thessaloniki, Greece, to begin Master's degree study. "Her work has distinguished itself in its thoroughness and attention to detail. She has a very solid technique which, coupled with fiery enthusiasm and magnetic concentration, results in very compelling performances. "Her first recital was of professional calibre and was very well received by faculty and students. She was asked to perform the Liszt E-flat concerto with the University Sinfonia as part of the regular series, a privilege usually reserved for faculty and prominent guest artists. She participated as one of two pianists in the Chamber Music program of the Blossom Festival School of Kent State University and the Cleveland Orchestra. "Ms. Stamatelos has a good list of recital and chamber music appearances in Greece, Austria and Canada. She is a young artist who is ready to take the necessary steps for a concert career and, besides her innate talent, she has the determination to fulfill her dream. I recommend her most highly." "I have known Ms. Stamatelos for a little over a year in her capacity as a graduate student at Kent State University and also as a student in the Blossom Festival School-Music in the summer, 1985 season. "Katerina came to the School of Music with an excellent background. All of this good experience shows forth in her performance. She is an excellent pianist. My personal work with her in coaching her in the Blossom Festival School program was a very rewarding experience for me, for her response and quick musical grasp of her chamber music role in performance was a pleasure to shape. Her solo performances are both technically solid and musically exciting." "The performance showed a highly developed sense of poise and style. Very musical phrasing and sensitivity. Very beautiful rich tone and feeling for lyrical line. "Katerina projects maturity and professionalism in her manner and performance. A great joy to hear." 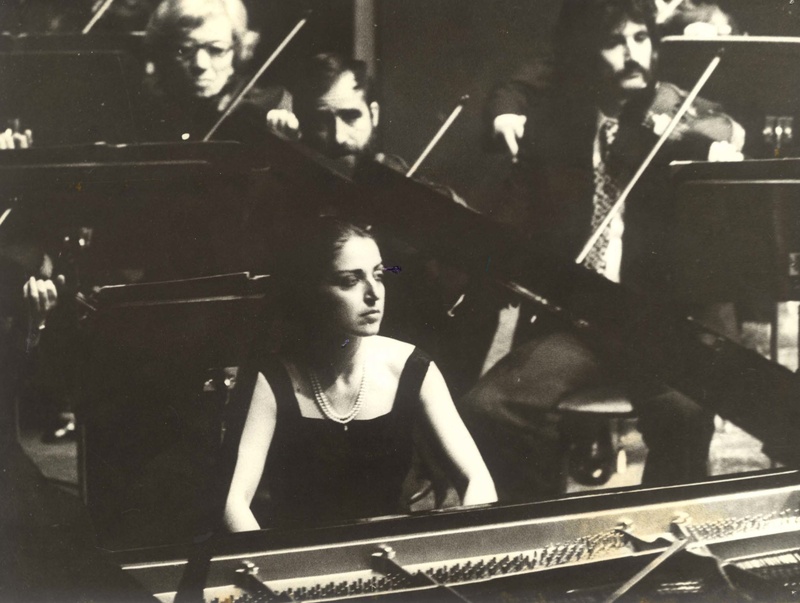 "Katerina played an especially fine recital March 20, 1986. What made it out of the ordinary was her inborn ability to project the music to the audience, that is, rivet their attention, make them aware of the music, cross the space between performer and audience. Katerina's range of dynamic levels, from a true pianissimo to a true fortissimo (including convincing crescendos and diminuendos) was most satisfying, as was her sense of the musical shape of the works."